Along with introducing its new Fire HDX range, Amazon has refreshed its 7-inch Kindle Fire HD, which will now tote a very low US$139 (about £86, AUD$148) price tag. 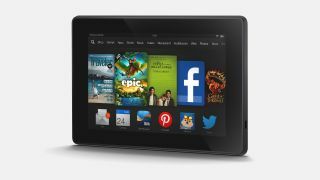 The new Kindle Fire HD sports a 7-inch screen with 1,280 x 800 resolution, at 216ppi, which sits close to the full-size iPad, which has a 264ppi Retina display. The new Kindle HD is also powered by Amazon's new Fire OS 3.0 "Mojito" and a dual-core 1.5Ghz processor, which apparently makes it 60% faster than the previous generation of Kindle Fires according to Amazon. It also has dual-band Wi-Fi, dual speakers with Dolby Digital Plus and a battery life quoted at 10 hours of mixed use, similar to its 8.9-inch brother. But unfortunately while the older 8.9-inch Kindle Fire HD gives you the option for 4G, the 7-incher remains LTE-less. It also does away with any cameras, but is lighter at 345 grams. Of course, the missing features and smaller form means a lower price, one that starts at US$139 for the 8GB variant and US$169 (about £105, AUD$180) for the 16GB model. It's still cheaper than the older-gen 7-inch Kindle HD, which had a starting price of US$199 for a 16GB option. "Two years ago, we revolutionised the tablet industry with the breakthrough $199 price point for tablets - now we're doing it again with the $139 price point," said Jeff Bezos, Amazon.com founder and CEO. You can add US$13 to each model if you want the 7-inch Kindle Fire HD without Amazon's "Special Offers". Pre-orders begin today, with both variants due to begin shipping from October 2. Not sure about the new 7-incher? Why not check out the Kindle's closest, but pricier rival, the new Nexus 7?